As I was playing with my makeup, I noticed that I had a lot of similar products. It would be interesting to do new blog series called "Product Battle", where I place two products head to head which are in similar categories, and see which performs best. I hope this helps you when you're trying to decide which is the better product to purchase. 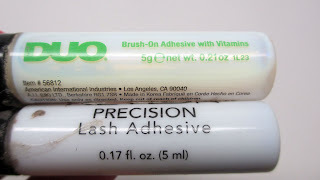 Today I'm talking about Brush On Eyelash Adhesive, a must-have in my collection. The Duo Adhesive actually has more product - .21oz vs Revlon's .17oz. Per www.drugstore.com Revlon retails for $4.99 and Duo retails for $5.49. 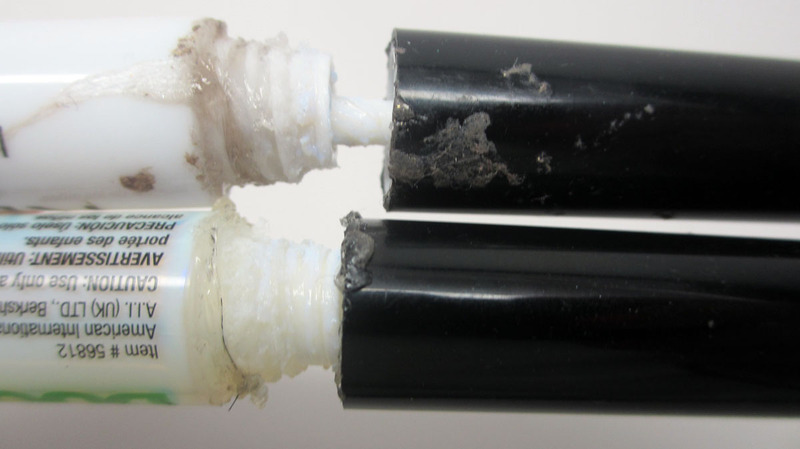 They both have a similar consistency...they come off as a whitish blue in the wet state, but then dry clear. 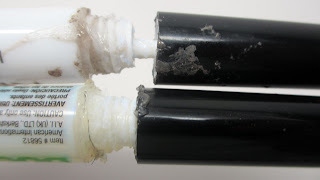 Both of them truly do dry clear, not like some lash glues which have a shiny finish. The major problem with both is that they get majorly gunky. I love having the brush on applicator because it makes painting on the glue to the lash band so much easier. However, the packaging for both seems to be flawed in the sense that after a few months, it's hard to open and close the bottle due to the built up reside. However, that won't keep me from repurchasing because I love it just that much. 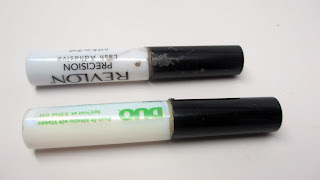 And the Winner of the Product Battle is Revlon Lash Adhesive! Overall, I prefer Revlon and will continue to repurchase it over Duo. Honestly, it dries much faster and has a stronger hold. It also comes in a dark formula which I purchased but haven't tried yet. I do find that these products can be difficult to find in the stores...Revlon seems to be sold out a lot and Duo isn't as widely available. I recommend getting them online - I purchased mine from www.Drugstore.com. I hope this was helpful. If you have any recommendations for more Product Battles, let me know in the comments below! Ohh im so glad u r doing this series! I just bought the Revlon one and now im excited to use it! :) thanks Ren! Great idea! Thanks for sharing these products. 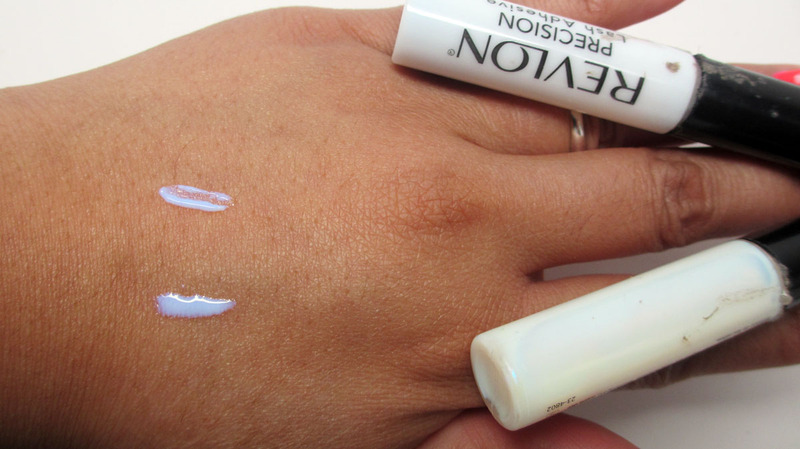 Can you please tell me what you are in the Revlon Colorstay Liquid Foundation? I'm having a hard time choosing a shade but your skin tone as well as the dryness is similar to mine. This would be most helpful. Thanks so much. Recently, I came across the locally based online adhesive supplies at Sheffield, which proved to be truly beneficial for my woodworking industry. I do not have to worry about the regular supply of adhesives anymore.